• Jeudi 1er Juillet à 20h30. Remix audiovisuel en direct d'Elizabeth Tesla & Wayne Frost - 50 minutes. En 2007 la vidéaste Elizabeth Tesla et le musicien électro Wayne Frost voyagent en ex-Yougoslavie et le documentent par leur film I came to find you. Retraçant un retour aux sources au rythme des musiques qui accompagnent la reconstruction des villes et des existences dévastées par la guerre. En 2009 ils créent The Other Side, un remix de leur documentaire en temps réel sur trois écrans. A la frontière du concert, du documentaire de création et de la performance, The Other Side est une œuvre multimédia qui explore les nouvelles formes de langages visuels et scéniques. Projet soutenu par le Pôle Image Haute Normandie et le CNC (DICRéAM). • Jeudi 8 juillet 2010 à 21h00. London-based guitar player Rick Tomlinson released his critically-acclaimed second full length album under the name 'Voice of the Seven Thunders' in 2010 on Tchantinler / Holy Mountain Records. Tomlinson's records are typically difficult to classify and have so far covered plenty of ground - from fractured acoustic songs and electronic drone experiments to wavy Eastern fuzzed-up electric freakouts and krautrock-inspired jams. This is one of only a handful of solo appearances this year and follows recent UK dates with Hope Sandoval. Pigeons are Wednesday Knudsen and Clark Griffin. Frequently collaborating with guitarist Carter Thornton, they make sublimely blasted / incredibly hallucinogenic songs from their base up in Bronx, NY. Pigeons have been active for a few years, releasing miniature-run cassettes and lathe cuts for Griffin's sub-underground Moran Tape Label that dealt in skronk, warp & mystery. Their wayward song-based creations are just as ambitious, melding dissonance, crude electronics & chanson pop . The pop element in their tunes, fully introduced on their brilliant Virgin Spectacle LP on Black Dirt, firmly rests as the oddest element in the mix. Connections to the No Neck / Sublime Frequencies & The Sea Donkeys exist, but Pigeons are wholly on their own plane. Pigeons have a brand new album, "Si Faustine", on Olde English Spelling Bee. No Deposit No Return Blues is a documentary K.C. 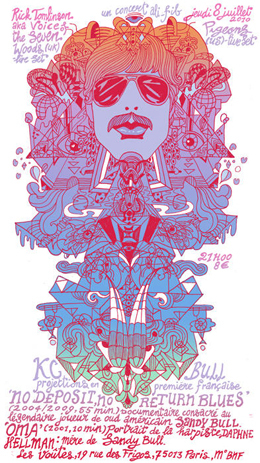 Bull made about her father, psychedelic rock legend Sandy Bull. He played the role of the outsider, writing meditations on his instrument and bringing classical music to the cosmic happening. He was many things, but the way the film remembers him is through his instrument and how it connected him to the outside world. In the early sixties, before such six-string heroes as Ry Cooder, Leo Kottke and Richard Thompson impressed with their ability to hop among and fuse musical genres, Sandy Bull glided from classical and jazz to ethnic music and rock & roll with grace and verve. Incorporating elements of folk, jazz, Indian and Arabic-influenced dronish modes, Bull’s ethereal, psychedelic folk-rock recordings which looked beyond American roots music for its inspirationand performances, made him a cult-hero to a generation of musicians and adventurous audiences. In 2001 Bull died of lung cancer, but not before his daughter began to fashion a personal portrait of a gifted musician and moving ode to a father and daughter relationship. The film is KC Bull’s understated way of saying, “Have you heard of my dad? No? Oh, you should.” I agree, you should.